Shopping for Battle Beasts Mini-Figures? Get yourself the first series of Battle Beasts Minimates! 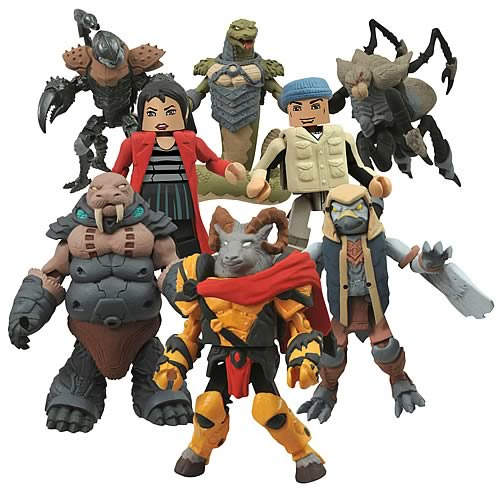 These excellent Battle Beasts Minimates Series 1 Mini-Figures feature 2-inch tall warrior animals, including exclusive comic-colors versions of Vorin the Ram with Scorpion and Merk the Falcon with Spider, as well as sets of Gruntos with Tate and Snake with Bliss. Human characters Tate and Bliss are only available in this Series 1 assortment, so don't miss out! Each Minimate stands 2-inches tall with 14 points of articulation and a variety of removable and interchangeable parts and accessories. Create your own hybrid Battle Beasts animal combinations!Ages 8 and up.